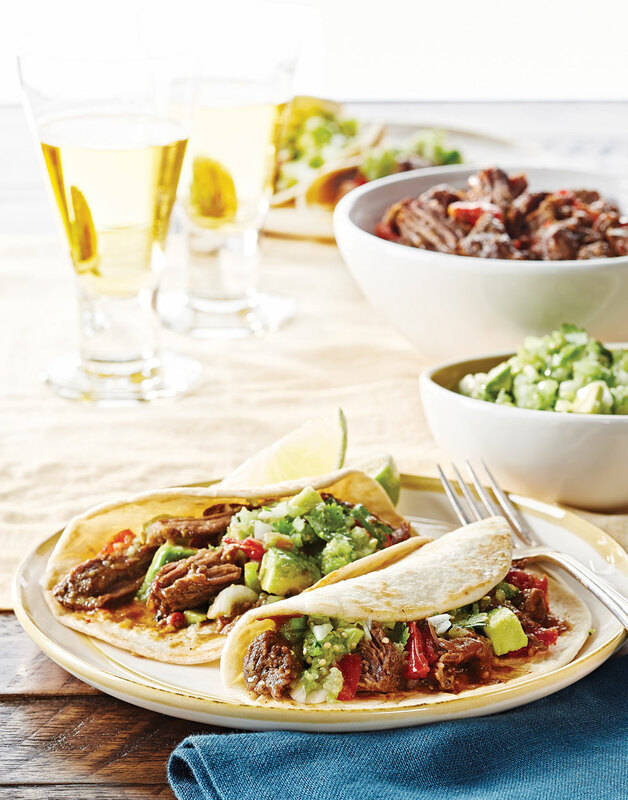 Feed family and friends with these slow-cooker Beef Short Rib Tacos. A riff on the classic Cuban ropa vieja, this recipe takes a Mexican-inspired twist with a tomatillo salsa, merging culinary borders to bring you the flavors of sunny locales. Short ribs are rectangles of beef cut from the rib section. English-cut ribs are cut between the bones, leaving a thick piece of meat sitting on one bone piece. For the tacos, soak guajillos and chipotles in a bowl of boiling water, covered, until softened, 15–30 minutes; drain, seed, and chop. Brown ribs, meaty side down, in oil in a sauté pan over medium-high heat, 7–10 minutes; transfer to a 5- to 6-qt. slow cooker. Add guajillos, chipotles, poblanos, onions, and garlic to same pan and sauté over medium-high heat until softened, 3 minutes. Deglaze pan with broth and vinegar, scraping up any brown bits; add oregano. Pour broth mixture over ribs. Cover slow cooker and cook ribs until fork-tender on high setting, 4 hours, or low setting, 6–8 hours. Transfer ribs to a platter and tent with foil. Strain slow cooker liquid through a fine-mesh sieve; reserve solids and liquid. Purée solids in a food processor. Skim and discard fat from liquid, then pour liquid into a saucepan; bring to a boil and cook until thick, 5 minutes. Stir in puréed vegetables; season with salt and pepper. Remove meat from bones and shred with two forks, discarding fat and gristle. Stir meat into sauce and bring to a boil. Stir in tomatoes; season with salt and pepper. For the salsa, pulse tomatillos, onion, cilantro, and jalape&tildeno in a mini food processor until diced. Stir in avocado and season salsa with salt. Serve short rib meat with tortillas, salsa, and cilantro. Soaking dried chiles in hot water softens their flesh so they’re easier to purée in the food processor. Add the puréed vegetables back to the cooking liquid to intensify the flavor and add natural body. Allow the short ribs to cool slightly, then remove meat from bones and shred using two forks.